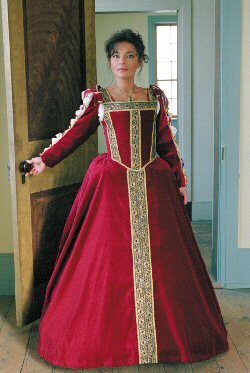 Eleanora of Toledo was the wife of Cosimo de'Medici, and the original of this gown, though now in fragments, is one of few extant Tudor period articles of clothing. The original dress, in velvet and silk was extensively studied by the great fashion historian Janet Arnold, and it is from these notes this dress was created. Our version, in 100% cotton velveteen with dozens of buttons and sumptuous jacquard trim, is sure to make heads turn at your next event. Sold by your natural waist size.